Virginia rorschach test: some see a destroyed landscape, others see campaign contributions. Legislation introduced in the General Assembly would keep Virginia’s gravy train rolling for coal companies. SB 44 (Charles Carrico, R-Alpha Natural Resources) and HB 298 (Terry Kilgore, R-Alpha Natural Resources) are framed as “limits” because the taxpayer-financed subsidies for coal mining would top out at $7.5 million per year. But watch your wallets: the primary objective of the legislation is to extend the coal subsidies an extra three and a half years, through 2019. So these bills should more accurately be seen as $25 million giveaways. The bills have been referred to the committees on Finance. It appears the coal companies need the money to pay bonuses to their executives. Alpha Natural Resources, which filed for bankruptcy in August to avoid paying creditors, plans to pay its top executives bonuses worth up to $11.9 million. Meanwhile, Alpha laid off more than 160 coal miners a week before Christmas. According to the Virginia Public Access Project, Alpha Natural Resources gave almost $500,000 in campaign contributions to Virginia legislators during the 2014-2015 election cycle. Carrico was the top recipient, raking in $24,267 from Alpha; Kilgore snagged fifth place with $20,000. Consol Energy gave over $236,000 to legislators over the same time period. Kilgore was their top recipient, at $12,500, while Carrico received $10,000. Note that both Carrico and Kilgore ran unopposed. In a separate attempt to give back to the coal industry, Ben Chafin has introduced SB 365 (referred to Transportation), a bill that would remove the Coalfields Expressway from the transportation prioritization process. If it were to pass, this strip mine disguised as a highway wouldn’t have to meet the normal standards required of real roads to be eligible for state funding. The disastrous Route 460 would also be excused, in case any future administration is dumb enough to revive it. Chafin is another Coalfields Republican who ran unopposed while hauling in more than $100,000 from donors in the energy and mining industries, including $15,000 from Alpha Natural Resources and $9,500 from Consol. The bankruptcy of Alpha, like that of dozens of other coal companies in recent years, threatens more than the campaign coffers of Virginia legislators. Coal mining has declined steadily in Virginia, leaving displaced workers who could make much better use that $7.5 million annually if it were redirected for job retraining and education. Right now, in contrast to the Republican rhetoric, only the Obama Administration seems to care about out-of-work coal miners. 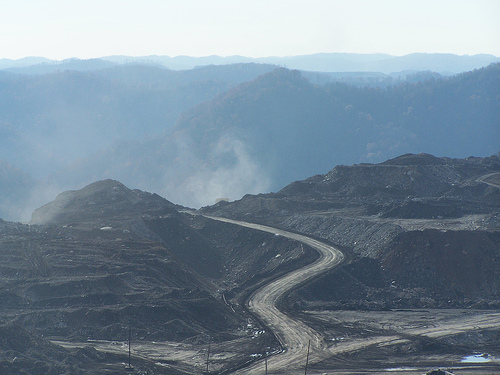 While ignoring workers, legislators are at least waking up to the threat posed to taxpayers when bankrupt coal companies walk away from their obligations to clean up and reclaim the land they’ve mined. HB 1169 (Todd Pillon, R-Abingdon, referred to Agriculture) would increase the amount of the reclamation bonds that mine operators must post, and give the Commonwealth a lien against the land. Meanwhile, Virginia’s coal legacy continues to have repercussions for communities across the state, wherever waste from burning coal has piled up in toxic ponds next to rivers and streams. For years utilities have taken an out-of-sight, out-of-mind approach to coal ash, quietly ignoring the potential for devastating spills like the one that contaminated the Dan River. In Prince William County, Dominion Virginia Power proposes to close one of these leaky coal ash ponds by draining the water out of it and slapping on a cover. A compliant Department of Environmental Quality just issued Dominion a permit to discharge the partially-treated wastewater into Quantico Creek, which flows directly into the Potomac River. In response, Democratic Senator Scott Surovell, whose district includes this section of Prince William County, has filed SB 537 (referred to Agriculture, Conservation and Natural Resources) to require the removal of all waste from closed coal ash ponds for proper disposal in permitted landfills that meet federal standards. UPDATE: A January 21 news report informs us that Alpha Natural Resources owes Wise County, Virginia, nearly $1.46 million in unpaid taxes for 2015, with another $1 million owed to Dickenson County. Please feel free to make the appropriate snarky comments; I’m still stuck in a “you gotta be kidding” loop. UPDATE 2: Not content to let Senator Carrico get all the glory giving away Virginia taxpayer money to pay multi-million dollar bonuses to tax-evading coal bosses, Ben Chafin has filed his own bill to do the same thing. SB 718 appears to be the same as SB 44 and has also been referred to Finance.